Imagine an empty expanse of field: quiet, flat, nondescript. One day, seemingly by magic, the field is punctuated by a vibrant big-top tent filled with strange colors and sounds, and the mind-bending feats of costumed performers. As we enter the tent and cross the threshold of the ring we come to a distinct space: the space of the spectacle. Here, now, we suspend the everyday in favor of the extraordinary an experience that is both visceral and significant. This is the function of spectacle, the function of circus. The circus is visceral. Humans are watchers and doers, with brains that can see and feel with one another. A capacity to watch and learn evolved across generations because it provided us with an adaptive advantage for survival. This mirror system is what brings us to the edge of our seats as we gaze up at the flying trapeze, gasp at the triple back flip from the teeter board, and sigh with relief at the successful landing. It helps us to cry with the sad clown and laugh with the happy clown, to connect emotionally with one another. As we watch the unusual and exciting performance, our hearts pound and our hands sweat. One might think we, the audience, are the ones in danger. As if we were the ones risking our bodies with each death-defying aerial maneuver. But it is precisely the lack of threat-of-harm for the audience that garners us so much pleasure. We are able to experience all of the physical excitement of a dangerous situation without actually being in danger and this excitement is slow to fade. If you are a lover of scary movies or roller coasters you understand this experience implicitly. Finally, we are seekers of novelty with brains that reward us for detecting the unusual and interesting around us. If Circus Oz is anything it is novel, uniquely Australian, and filled with inventive performances. The circus is significant. When it rose to popularity in the 19th century, the circus was an opportunity for the masses to momentarily suspend the frightening reality of the Industrial Revolution; it was a means of processing the sweeping changes that were catapulting humanity forward into the modern age. It was the circus that would be the first subject to be illuminated by incandescent light. And under this light, a structured mimesis would captivate the masses, both by showcasing humanity’s increasing mastery over the natural world and by the spectacular and symbolic representations of the wire walker, lion tamer, juggler, and clown. Regardless of which era, the above are not simple acts, and their content is no accident. They serve as metaphor for fundamental human struggles. We all at times take risks, attempt to balance conflicting aspects of complicated lives, and emotionally wrestle with a sometimes absurd existence. In a sense the circus is therapeutic, providing a structured space to bring to light those anxieties and desires and to process them. Tonight, there are no canon shots, no trained elephants, and no lion tamers. These were the objects of a circus of the past. Make no mistake, Circus Oz is still the circus of the spectacle, but it is their unique style and creative atmosphere that has changed the focus of the spectacle and the nature of circus. 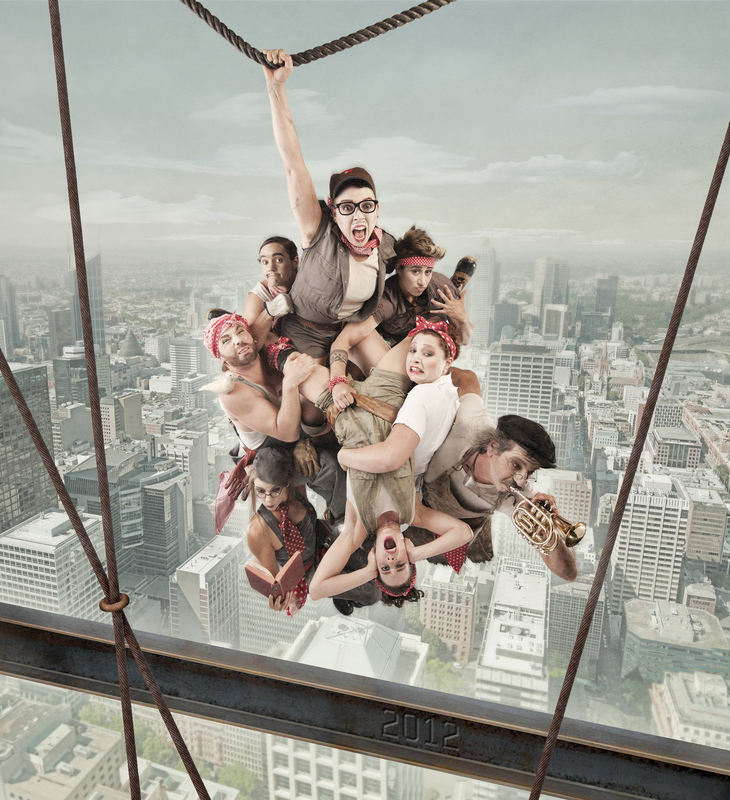 Circus Oz is a new medium for a new message: the circus of now, a circus of equality and collaboration. Tonight’s performance is more than just a show; it is a shared experience between the audience and performers where we have the opportunity to connect both in the material and immaterial of the spectacle. Do not sit back and enjoy the show. Come to the edge of your seat, gasp, wonder, and feel as the artists of Circus Oz make manifest that which resides within all of us. Aaron Godlaski joined Centre’s faculty in 2012 as an assistant professor of psychology and behavioral neuroscience. He received his M.S. and Ph.D. in clinical psychology at the University of Kentucky, where he studied alcohol and human behavior. Following the completion of his dissertation, he interned at SUNY Upstate Medical University and Hospital in Syracuse, N.Y., specializing in clinical health psychology and outpatient psychotherapy. Godlaski’s research interests include the effects of mindfulness meditation on cognitive and physiological processes, and the effects of alcohol on human behavior. He is also interested in pedagogical innovations associated with meditation and other contemplative practices, and how such practices can enrich the lives of students. For more information on Circus Oz at the Norton Center, or to order tickets, please visit us online or call the box office at 1-877-HIT-SHOW.